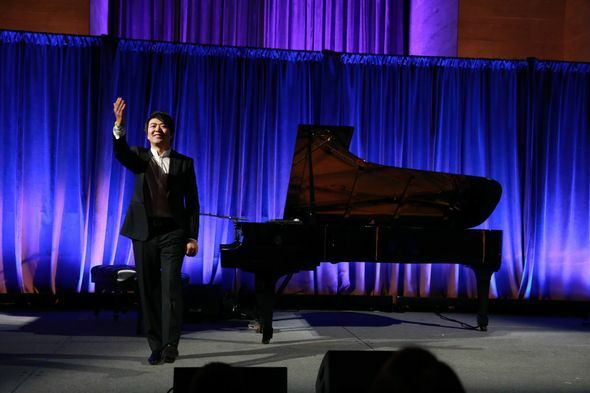 The Lang Lang International Music Foundation Gala was held last night at the iconic Cipriani in New York City, and it raised over $2 million for music education in public schools across the country. The total more than doubled the fundraising efforts from the two previous galas. At the event, Joan H. and Sanford I. Weill were honored with the Lifetime Philanthropy Award. Grammy Award winner Michael Feinstein, students from Harlem’s P.S 46 Children’s Choir, Boston Arts Academy Jazz Quintet and Young Scholar pianists were among the performers. Lang Lang closed out the evening. Tony and Emmy Award winning actor Jeffrey Wright was also on hand. I was fortunate to catch up with the international superstar, and ask him all about his Foundation, the evening in general, and his “rock star” career thus far. So many know you for your music, but talk to me about LLIMF and its importance. I was very fortunate to receive an amazing music education when I was young, and that opportunity brought me to where I am today. There are so many children in the world today who have no access to music, and I wanted to change that. It’s been eight years since I started my Foundation, and since then, we’ve impacted hundreds of thousands of kids! We provide piano labs in public schools, hold concerts and masterclasses with kids in their hometowns, do music and art therapy in pediatric hospitals, and send our talented young scholars to competitions all over the world. It’s really amazing to see the impact our programs are having. In the Keys of Inspiration program, we create a safe space for kids to learn and play piano together in a classroom. It gives children a safe environment to explore their creativity, and express themselves. It provides a place where children can learn to work together, to listen to their peers, and be supportive of each other. It’s a place where they can learn to be brave, take risks, and discover their talents. I want to show children what they’re capable of achieving! How and why did you choose the mission for your foundation? I travel so much, and am always meeting young musicians who need support and access to a music education. Public schools have no music, and I realized that as a musician, I was responsible for taking action to bring music back! I want to put music back in the public schools, because I know that music has the power to change lives. Even though you’re a classical music artist, is it OK if I refer to you as a rock star? All music is important. I think it’s fun to challenge myself and break out of the stereotype of my genre, but the classical music repertoire is and always will be my home. You have so many highlights in your career thus far, what ranks in your Top 3 and what do people often stop you and want to ask about the most? People always stop me and ask for my picture! It’s fun, I love meeting my fans! There have been so many highlights in my career, and I have had the honor of performing in so many amazing venues with so many talented artists. But right now, my top three moments would be my performance at Chicago’s Ravinia Festival. I was in the right place at the right time, and went on to replace Andre Watts. It was the moment that made my career. I think I owe Mr. Watts a big thank you!The next would be when I created the Lang Lang International Music Foundation. It was such a special moment, because I realized I could finally use my music to make a difference in children’s lives.Lastly, I had the incredible honor of performing during the opening ceremony of the 2008 Beijing Olympics. It was amazing to take part in such a special occasion in my home country, and I’ll never forget it! Describe the juxtaposition of playing with artists like Metallica and Pharrell Williams. It’s so exciting to collaborate with other talented artists, especially when they are performing so far outside the classical genre. The important thing to remember is that even though we perform different styles of music, we are all still musicians. I have enormous respect for them, and their work. It’s always an honor to collaborate with such talented people. When such different styles of music come together in one piece, it enhances the song with a fresh perspective. What music do you listen to – tell me one artist we might not expect on your playlist.My musical taste is very varied, so it wouldn’t be fair of me to name just one! It’s all valuable, important, and beautiful. Who helped shape your career the most? My parents gave me the gift of music—without them, without music, I don’t know what my life would be like. I also owe a great deal of thanks to my teacher, Gary Graffman, who helped me transform into the artist I am today. Can you impart some words of wisdom for my nearly two-year-old son? I would tell your son to attend an event from my Foundation! Start listening to music now, especially classical music. It’s so important to start early, and to learn an appreciation for classical music at a young age. Music is a language, so the earlier you learn it, the more fluent you will be. We speak of juxtapositions above so it seems only fitting that we throw a complete curveball for part two of our A-Sides today: a session by the extremely gifted singer/songwriter Elijah Ford. The musician comes from a family of musicians – notably his dad is Marc Ford formerly of The Black Crowes. But, he’s without question, his own artist. The gifted singer/songwriter just dropped his his new album As You Were in September, and is filled with honest lyrics and infectious hooks. Last month, he dropped by the Music Conservatory of Westchester for a chat and awesome performance. Watch it below you will.